One of the best experiences a visitor should have in Papua New Guinea is attending a festival, where groups perform tribal dances in flamboyant body decorations, an enthralling show celebrating traditional culture like none other. 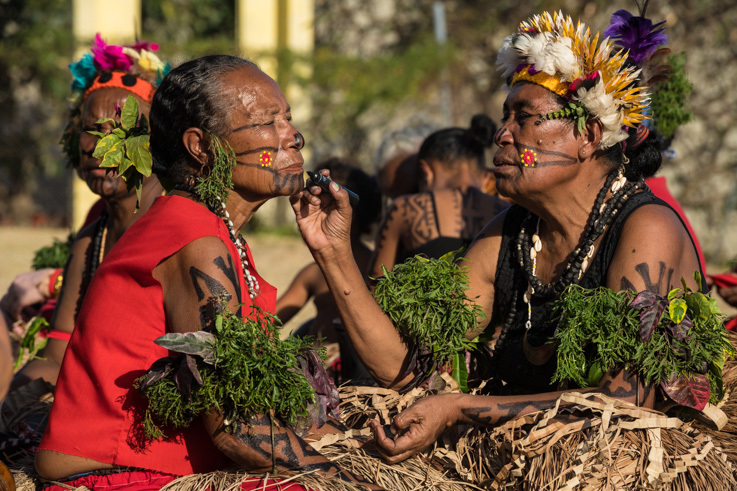 Here are some festivals and events in Port Moresby worth planning your trip around. First on the list is witnessing a sing-sing, a celebratory dance portraying ancient traditions through colorful costumes and sounds. While the most famous sing-sings take place throughout the country showcasing customs maintained in remote villages, Port Moresby’s three-day Hiri Moale doesn’t lack panache. Held every year at Ela Beach around the Independence Day weekend, the festival honors the centuries-old customs of the Motu people. Sailing to the Gulf of Papua in giant hand built canoes known as lagatoi to trade clay pots in exchange for food, the festival celebrates the long-enduring maritime journeys of the past with traditional dances and reconstructions of the lagatoi sailboats pulling on Ela beach. Music is ever-present and there is a Hiri Queen contest. Globally known for its numerous species of sublime orchids, with an estimated 3000 species alone, Papua New Guinea is the uncontested orchids paradise. In an effort to educate the people about the richness of its native orchids, the National Orchids Festival is held every year on the 19thand 20th of October by the Papua New Guinea Orchid Society. Held at the National Parliament House in Waigani, expect few thousand species of orchids to be displayed. Staged every year on the 16th of September at the University of Papua New Guinea in Port Moresby, this celebration gathers an extraordinary showcase of distinct cultures and traditions displayed by students from the country’s 22 provinces. Join the carnival atmosphere along hundreds of other locals and visitors. Following eight gripping editions, PNGHRFF is the only major film festival in the country offering local and international filmmakers the chance to show their feature films, shorts or documentaries to thousands of people across Papua New Guinea, free of charge. The annual “non-profit” event extends over two months in four locations in the country, covering important topics such as human rights issues affecting the Papuan society, in an effort to increase consciousness.